HTA President Sheela Lingam (green sari) with the new executive committee. Despite cold and rainy weather, more than nine thousand devotees and visitors from all over South-East thronged the Hindu Temple of Atlanta (HTA) Riverdale, Georgia on Tuesday, January 1st to celebrate a joyous and spiritually suffused Navodaya 2019 festival. All the deities in the Balaji and Siva Temples wore a dazzling look in their ornate fineries and colorful garlands. The learned and experienced priests Sri Gopal Bhattar, Sri Srinivas Sarma, Sri Pavan Kumar, Sri Siva Naga Kumar, Sri Sunil Kumar, Sri Ravisankar, Sri Veda Vyasa, Sri Murali Krishna, Sri Govardhanam, Sri Bharath and Sri Subramanyam cheerfully performed Archana’s throughout the day blessing all the devotees who came to offer their prayers. 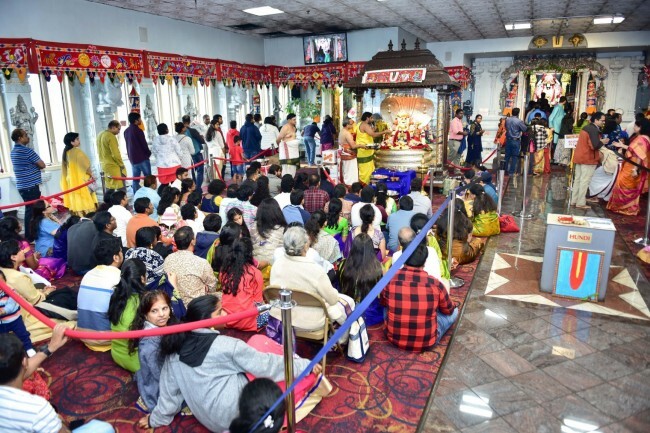 The temple management and the 400 plus volunteers made elaborate arrangements to assist with Parking, Puja , Shopping and Dining in the temple kitchen. The Hindu Temple’s new President is Smt. Sheela Lingam, an ardent and long-time devotee who has been with the Temple since 1986. She has served in various official capacities in the Temple and she became a HTA Trustee in 1996. She effusively commented,” I am very happy with the unprecedented turnout of over 9,000 devotees today to seek God’s blessings on ‘Navodaya’, New Year’s day. The new Executive Committee and I underwent Oath ceremony conducted by Temple’s Attorney Mrs. Sowmya Sikhal. The Executive Committee Members are: Vice President” Subbiah Emani; Secretary: Aravind Goli; Jt.Sec.Ravi Kari; Treasurer: Sai Surapaneni; Treasurer: Prasad Tummala; and Past President: Kusuma Kotte. 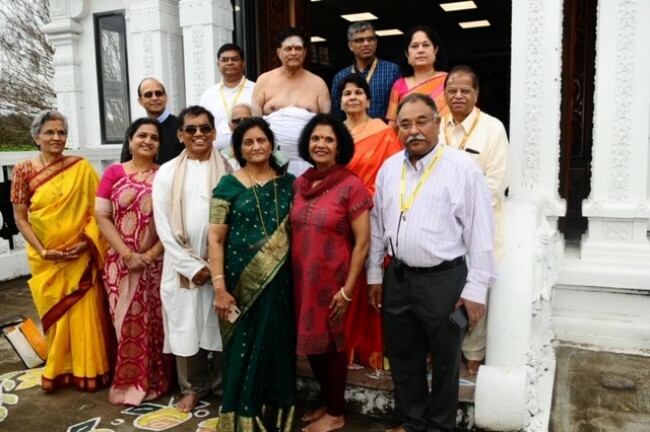 Sheela Lingam further commented, “I wish to thank all the generous sponsors, trustees, past Presidents, Executive Committee members, vendors, and all the visitors and devotees. I also wish to thank scores of enthusiastic and disciplined volunteers who worked hard to make Navodaya celebrations a joyous experience. All the priests also worked hard and for long hours starting on 31st December, in putting up the captivating, artistic and colorful décor and conducting the pooja ceremonies. 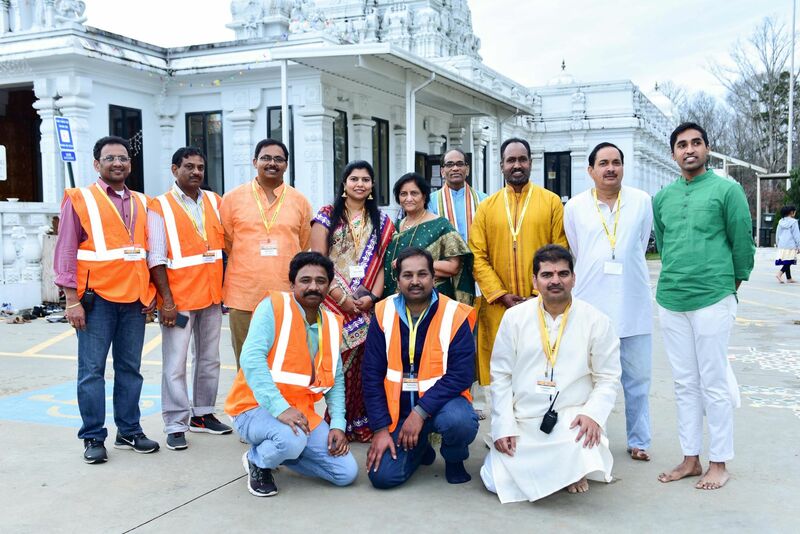 HTA served delicious food prepared by Sri Srinivasan and Sri Rama Krishna along with young band of energetic volunteers who served the delicacies to thousands of devotees in the Temple Banquet hall. The vendors did brisk business as always. Children enjoyed delicious food and lot of fun activities like face painting, mehendi, cotton candy, and balloon twisting. I wish to thank the Police, security staff and volunteers led by Ravi Chander for managing the parking areas. The Executive Committee, the Temple staff and I will focus on building infrastructure like construction of the perimeter wall for enhanced security, beautification and landscaping around the Temple grounds, upgrading of kitchen &dining facilities to serve the devotees better. Finally, “My thanks to all the devotees who celebrated Navodaya 2019 with great enthusiasm, and joy and deep reverence. My heartfelt wishes for a happy, healthy, spiritually enriching and prosperous New Year to all”.